Sediment deposited by the lake with a hammer for scale. Lake Missoula was a prehistoric proglacial lake in western Montana that existed periodically at the end of the last ice age between 15,000 and 13,000 years ago. The lake measured about 7,770 square kilometres (3,000 sq mi) and contained about 2,100 cubic kilometres (500 cu mi) of water, half the volume of Lake Michigan. The Glacial Lake Missoula National Natural Landmark is located about 110 kilometres (68 mi) northwest of Missoula, Montana, at the north end of the Camas Prairie Valley, just east of Montana Highway 382 and Macfarlane Ranch. It was designated as a National Natural Landmark in 1966 because it contains the great ripples (often measuring 25 to 50 feet (7.6 to 15.2 m) high and 300 feet (91 m) long) that served as a strong supporting element for J Harlen Bretz's contention that Washington State's Channeled Scablands were formed by repeated cataclysmic floods over only about 2,000 years, rather than through the millions of years of erosion that had been previously assumed. The lake was the result of an ice dam on the Clark Fork caused by the southern encroachment of a finger of the Cordilleran Ice Sheet into the Idaho Panhandle (at the present day location of Clark Fork, Idaho, at the east end of Lake Pend Oreille). The height of the ice dam typically approached 610 metres (2,000 ft), flooding the valleys of western Montana approximately 320 kilometres (200 mi) eastward. It was the largest ice-dammed lake known to have occurred. The periodic rupturing of the ice dam resulted in the Missoula Floods – cataclysmic floods that swept across eastern Washington and down the Columbia River Gorge approximately 40 times during a 2,000 year period. The cumulative effect of the floods was to excavate 210 cubic kilometres (50 cu mi) of loess, sediment and basalt from the channeled scablands of eastern Washington and to transport it downstream. These floods are noteworthy for producing canyons and other large geologic features through cataclysms rather than through more typical gradual processes. In addition, Middle and Early Pleistocene Missoula flood deposits have been documented to comprise parts of the glaciofluvial deposits, informally known as the Hanford formation that are found in parts of the Othello Channels, Columbia River Gorge, Channeled Scabland, Quincy Basin, Pasco Basin, and the Walla Walla Valley. 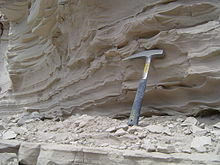 The age of these deposits is demonstrated by the presence of multiple interglacial calcretes interbedded in these glaciofluvial deposits, sequences of sediments with normal and reverse magnetostratigraphy, optically stimulated luminescence dating, and unconformity truncated clastic dikes. Based upon these criteria, Quaternary geologists estimated that the oldest of the Pleistocene Missoula floods happened before 1.5 million years ago. The older Pleistocene glaciofluvial deposits within the Hanford formation are fragmentary in nature because they have been repeatedly eroded and largely removed by subsequent Missoula floods. Because of the fragmentary nature of older glaciofluvial deposits, the exact number of older Missoula floods, which are known as Ancient Cataclysmic Floods, that occurred during the Pleistocene cannot be estimated with any confidence. Although Lake Missoula likely was the source of many of the Ancient Cataclysmic Floods, the fragmentary nature of the older deposits within the Hanford formation makes precise determination of the precise origin of the floods that deposited them very difficult. ^ Bjornstad, Bruce N. (c. 2006). On the trail of the Ice Age floods : a geological field guide to the mid-Columbia basin / Bruce Bjornstad. Sandpoint, Idaho: Keokee Books. p. 4. ISBN 978-1-879628-27-4. ^ Soennichsen, John (c. 2008). Bretz's Flood : The Remarkable Story of a Rebel Geologist and the World's Greatest Flood / John Soennichsen. Seattle, Washington: Sasquatch Books. pp. 215–248. ISBN 978-1-57061-631-0. ^ Alt, David (c. 2001). Glacial Lake Missoula and Its Humongous Floods / David Alt. Missoula, Montana: Mountain Press. pp. 27–28. ISBN 0-87842-415-6. ^ Allen, John Eliot; Burns, Marjorie; Sargent, Sam C. (c. 1986). Cataclysms on the Columbia : a layman's guide to the features produced by the catastrophic Bretz floods in the Pacific Northwest. Portland, OR: Timber Press. p. 104. ISBN 0-88192-067-3. ^ Medley, E. (2012) Ancient Cataclysmic Floods in the Pacific Northwest: Ancestors to the Missoula Floods. Unpublished Masters thesis, Portland State University, Portland, Oregon. 174 pp. ^ Spencer, P. K., and M. A. Jaffee (2002) Pre-Late Wisconsinan Glacial Outburst Floods in Southeastern Washington—The Indirect Record. Washington Geology. vol. 30, no. 1/2, pp. 9-16. Wikimedia Commons has media related to Glacial Lake Missoula. This page was last edited on 24 March 2019, at 14:27 (UTC).